There's nothing more important than having a solid foundation, and more importantly is choosing the right construction company to make sure your concrete is installed correctly and properly. Our customers say we're the best in the business. We specialize in Commercial,Residential, and New Construction and have been in business for over 25 years. We only use the best materials, and are dedicated to completing each project in a timely manner. 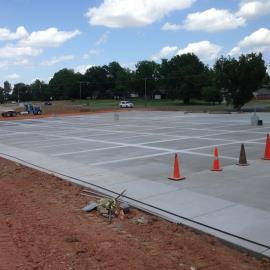 Specializing in parking lot Construction here is our recent project a new 60,000 sf parking lot with new sidewalks,curbs and light poles.